Thank you to our Premier Event Sponsors! 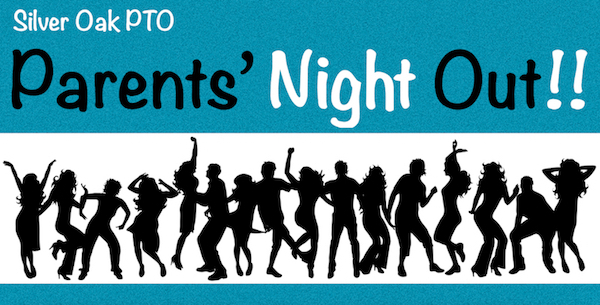 Parents' Night Out is an opportunity for the adults in the house to put on their dancing shoes, get a sitter for the kids, and come out for an unforgettable evening with the 21&up Silver Oak community in support of our school! The PTO is excited to announce that we have again partnered with Silver Creek Valley Country Club to host our event! The focus of this year's event is to bring our adult Silver Oak community together for a night of dining and dancing! There is no auction, and there will be an expanded dinner offering, as well as an addiional hour of dancing! Any proceeds raised from the event will benefit the STEAM program at Silver Oak. General admission tickets include the opportunity to win amazing door prizes! If you would like to gift tickets to a teacher or Silver Oak Staff member... you may opt to do so from our ticketing website, provided that they have not already been purchased. If you see "0 remaining" next to a staff member's name... those tickets have already been gifted. All are welcome to invite friends, and we would love to spread the word to Silver Oak alumni parents! If you are interested in learning about sponsorship opportunities for this event, or would like to volunteer to help, please contact PNO Event Organizers, Geraldine Leggio or Chelon Blanco. A purchasers of general admission tickets (presale or at the door) will be eligible to win one of our fantastic raffle door prizes!